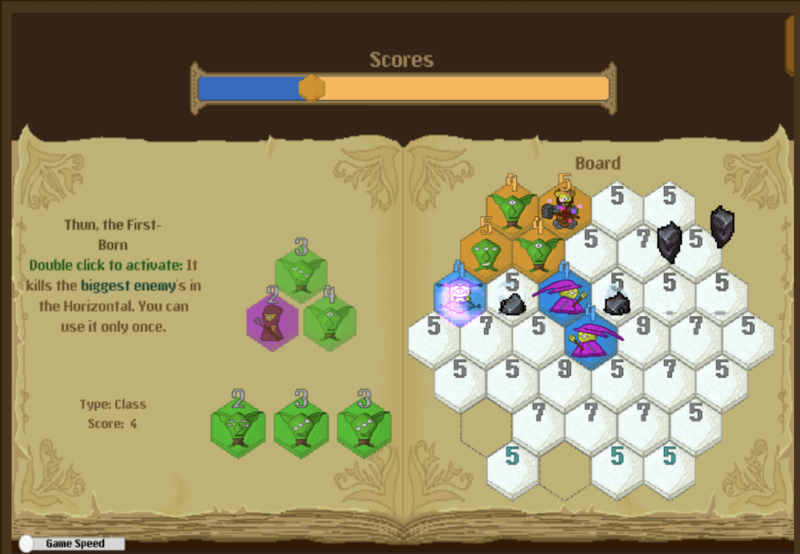 Hexroes is a 1-action turn-based resource strategy game which each player fights for supremacy of a hexagonal board. Sharing the same resources, the players can choose tiles from a pool of characters of the RPG genre and put them onto a board. 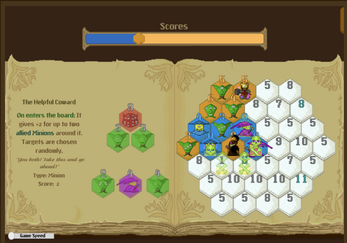 Each turn, players receive points according to their own characters, getting closer and closer to beat the enemy. Since both players pick tiles from the same place, named “Pool Tile”, they have to think carefully which tile to send to the board and which tile to leave for the opponent on the next turn. In order to maximize their own gains and minimize their losses, the players have to care about the tile’s classes, powers, positions, and abilities. Minions [Green Tiles]: Permanent tiles that can buff each other. They should be positioned very close to each other in order to make the best use of their buff ability. Class [Purple Tiles]: Permanent and more situational tiles. Each one has a single consumable ability triggered when the player wants. It counts as an action (pass the turn). 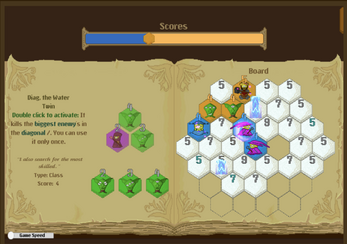 All the abilities are designed to provide for the player tools to destroy, cancel, buff, debuff or steal other tiles. Usually, the player who makes the better use of the class tiles wins. Abomination [Red Tiles]: Temporary tile that has the power of multiplied by the number of abominations that already went to the board. It is also a good tool to win the game, even more, if well “predicted” inside the pool tile. 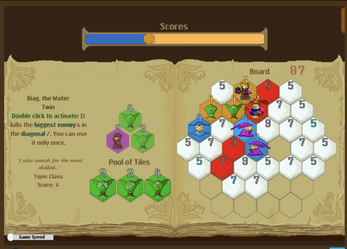 Board: Place where the players send the tiles. Each chosen position inside the board provides instant points when a player put a tile. Also, the board starts with a very small quantity of available positions and start growing along the match. Pool Tile: The Pool Tile is the zone where the players pick tiles. 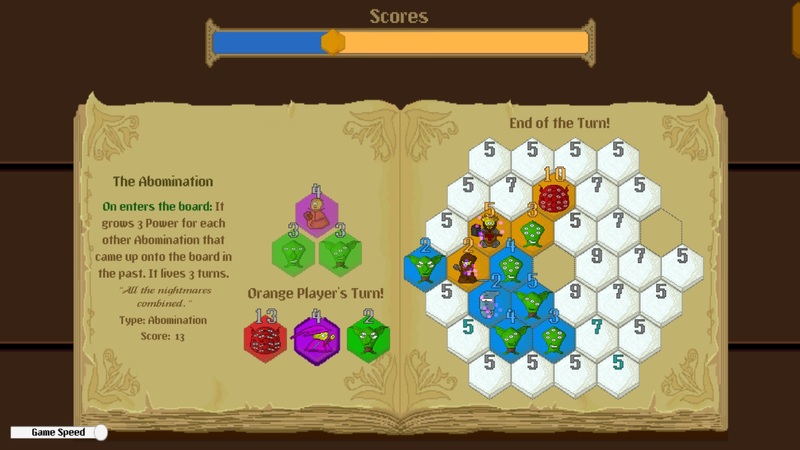 Only from the bottom, only one tile can be chosen to be sent to the board a turn. At the beginning of each turn, it also shifts according to the chosen position on the last turn. The Pool Tile is in a constant logical movement and it can also be another tool to beat the enemy.